Lauren Loves to Eat: Portland, Maine: Eventide Oyster Co.
Portland, Maine: Eventide Oyster Co. While heading back to the downtown Portland area after a delicious stop at Duckfat, we came across Eventide Oyster Co., which was on my list of restaurants to check out, but never made it into a specific meal slot. Well, we decided since we were right there, we might as well try it out. So glad we did. Two things to note: It's pronounced "even tide". No idea why I kept thinking it was "event tide". Secondly, the menu changes daily based on what is in season, so the prices below may be different during your visit. 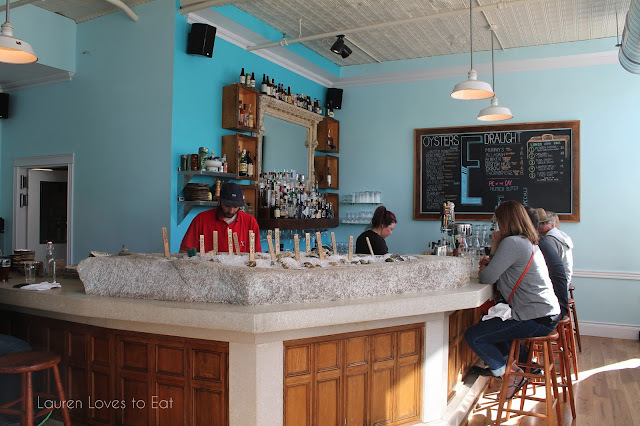 Inside the bright restaurant, there is high stool counter seating along the bar and front windows of the restaurant. We opted to sit outside at the picnic benches since the sun was still out and could keep us warm. 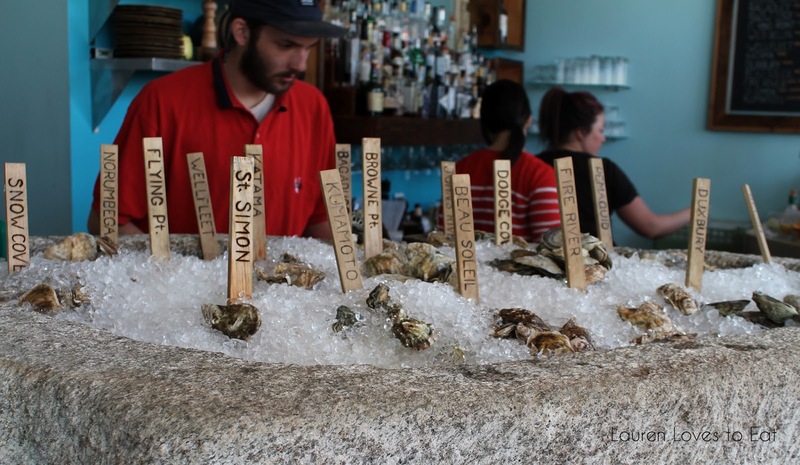 1/2 dozen oysters, $15: We tried the Maine oysters offered-- John's River, Flying Point, Pemaquid. 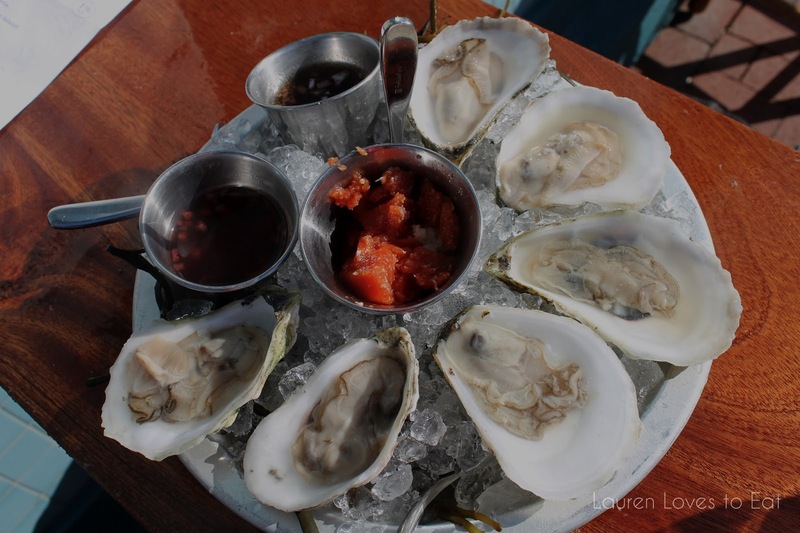 I loved the salty and briny John's River; found the Flying Point lacking in flavor; and liked finishing off with the very plump Pemaquid. Lobster Roll with brown butter vinaigrette, $13: Definitely on the small side, which the server did let us know beforehand. The bun was so soft and pillowy, and spread with delicious brown butter vinaigrette. Amazing. So amazing. The lobster was unbelievably fresh, and after we split this, a small piece ended up falling onto the board it was served on. I picked it up and ate it. The bf claimed that that piece had fallen off his half, and then proceeded to pick a piece off of my half of the roll. I grabbed an even larger piece off of his half, and then gobbled the rest of mine down. (I always win with food). Anyway, the conclusion of this story-- Eventide Oyster Co. is a MUST. It doesn't have the slightly toasted roll or lemon-squeezed lobster meat like at Luke's Lobster, but I promise you this version is just as life-changing. 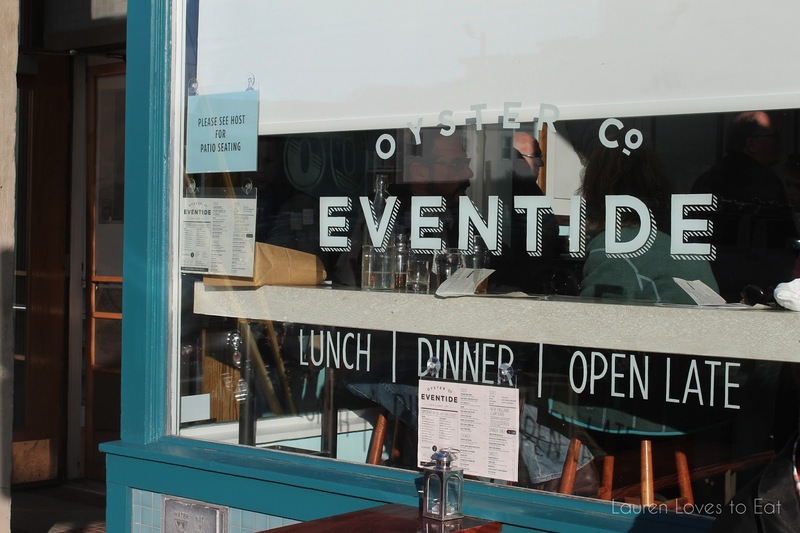 Since Eventide Oyster Co. doesn't offer a large selection of cooked dishes/hearty entrees, I would recommend visiting for a late breakfast, lunch, or afternoon snack. The drink menu is quite extensive and seemed to almost match the number of food items offered. Great pics! 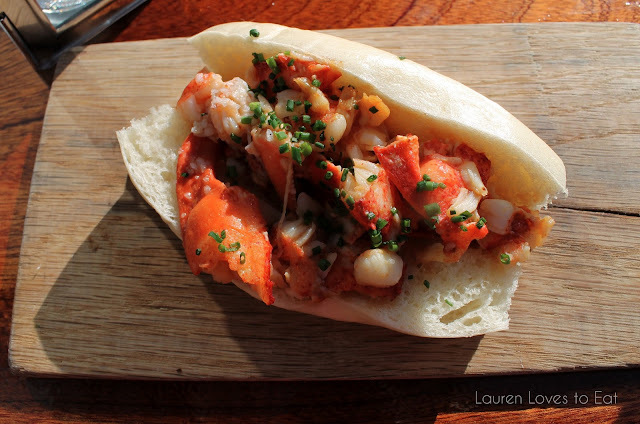 Lobster roll with brown butter vinaigrette sounds pretty amazing. It really was! It needs to become a more common thing.